Start your weekend the right way with Vinyassa Flow yoga at Saunton Sands with Bay Fitness, every Saturday 8am - 9am. On fine days yoga will take place on the lawn overlooking the miles of golden sands and rolling waves of Saunton Sands, in inclement weather, it will be held inside in The Gallery. Vinyasa Flow Yoga is bona fide brilliant for you and can help with a wide range of , whether you want to clear your mind or wish to reach the absolute pinnacle of physical and mental wellbeing. • Releases stress and teaches you to manage the mind - at work, in your sport and in everyday life. • Increases flexibility, strength through full range of movement and helps you to protect your body from injury. • Strengthens and develops long-lost muscles and improves sports performance. • Improves posture and alignment and helps you to develop healthy movement patterns to protect your back and reduce risk of injury. • Makes your mind still and strong. Our fully qualified yogis have a plethora of experience instructing people from all walks of life – from pro surfers to pro scaffolders. Everyone’s welcome – from novices to adepts. If you'd like to arrange a private yoga session at the hotel or or on the beach, just let us know and we can arrange it for you. Call us on 01271 890212 to discuss your options. Andrew Blake and his team at Bay Fitness run successful reboot retreats accross the world, with a wealth of experience in dealing with clients of all levels, including Olympic athletes and the world's best surfers. 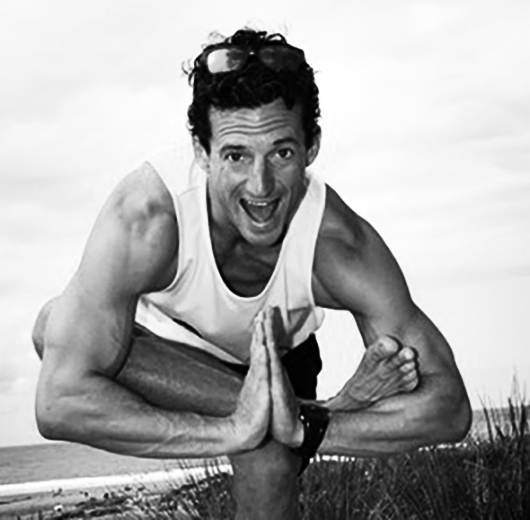 Andrew has qualifications in fitness, coaching, lecturing, massage therapy and vinyasa flow yoga. His fun and functional approach to fitness is addictive!